Craig Drake’s fourth solo art show is currently on display at Hero Complex Gallery and it includes an insane variety of amazing pop culture inspired prints and originals. One of The Blot’s favorite new pieces from the show is this beautiful Suicide Squad screen print featuring Margot Robbie’s Harley Quinn. The Blot’s a sucker for all things Suicide Squad, and to be honest Harley’s look in the movie is probably the best thing to come out of this extremely uneven live action film. 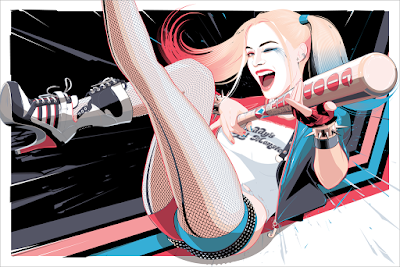 Harley by Craig Drake is a 36”x24” hand numbered screen print. Limited to 225 pieces, this DC Comics poster can be purchased now at the HCG online store for $65.